Home » Toyota Tacoma » How well can the 2018 Toyota Tacoma perform? How well can the 2018 Toyota Tacoma perform? There aren’t many segments of the automotive market more unique and interesting than light-duty trucks, which routinely show an ability to wow consumers with a blend of performance and durability not usually seen elsewhere. A good example of this punch and adrenaline is the 2018 Toyota Tacoma, which has again found itself on the top of the light-duty pile. Today we’ll show you its available engine options and performance capabilities so you can see for yourself just how well you can perform wherever you’re planning on taking it! 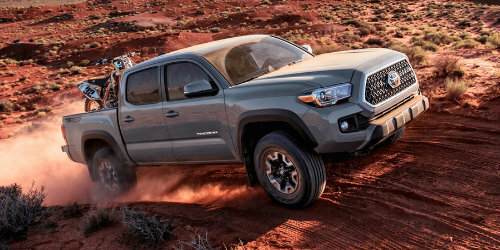 The Tacoma’s base engine isn’t short on adrenaline, as you’ll soon see; this 2.7-liter DOHC Inline 4 is capable of producing 159 horsepower and 180 lb-ft of torque, all the while being able to tow up to 3,500 pounds along for the ride. 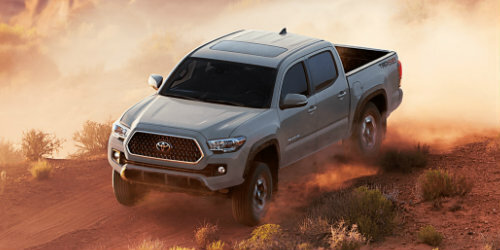 This means that with light, punchy energy by your side, trailers are still no match for the Tacoma’s capability! If you’re looking for just a bit more beef coming from the gas pedal, your search will conclude when you see what the Tacoma’s 3.5-liter direct injection 24-Valve V6 can do. 278 ponies lead the way, as well as 265 lb-ft of torque that is able to make your straight-line speed impressive! In addition, with available packages, you can tow up to 6,800 pounds! Responsiveness and searing testosterone are two hallmarks of any light-duty pickup, but especially in the case of the 2018 Tacoma. You’ll find a 6-speed Electronically Controlled Transmission on board, which switches gears smooth as silk no matter what you’re subjecting your vehicle to. In addition, part-time 4WD 4-Wheel Drive ensures that each wheel gets all the power it needs, whether you’re scaling cliffs or heading down the highway for another day at work. Check out some further research on the 2018 Toyota Tacoma! Looking for more information on the 2018 Tacoma? Feel free to contact our sales team right here at Alexander Toyota. We’ll get you behind the wheel and are more than happy to help you with anything you’d like to know about this light-duty legend! This entry was posted on Thursday, February 1st, 2018 at 6:05 pm	and is filed under Toyota Tacoma. You can follow any responses to this entry through the RSS 2.0 feed. You can skip to the end and leave a response. Pinging is currently not allowed.